We are glad to inform you that we released v2.01 of EasyWakeup. Now it’s multilingual! Russian, German, Spanish, Dutch are available now. We improved main program algorithm. v2.01 finds the opportune moment to awaken you more accurately. Also now you can see your night sleep graphs. And you can find optimal sensitivity for your body. 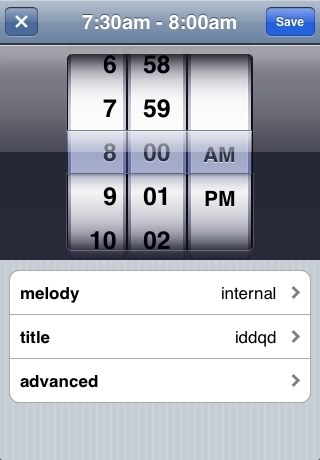 Important update: Put word “stat” in title of your alarm clock for activate night sleep statistics. Does using insomnia w/ the lite version use up more battery than the paid version? It sounds like a good idea, but will battery life be a problem? I’ve been reading about this app a long time ago, but something doesn’t quite like me and it’s that I have to sleep with my phone attached to my arm and I move A LOT while sleeping. Is there no other way to use it?